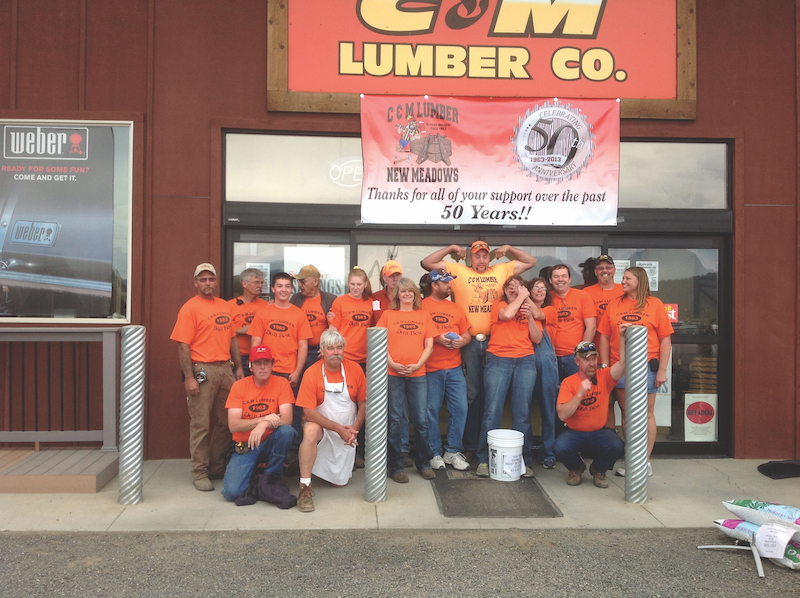 The folks at C&M Lumber of New Meadows, Id. (pop. 500 on a good day), have yet to launch a website. Phone service is often spotty; same for the Internet. I’d been warned to set my clock back by 20 years. So, when I finally reached Mark Peterson, co-owner along with his brother, Chris, I expected to hear the story of a mountain outpost selling sticks and nails to pioneers. The boys’ dad, a U of Idaho grad, worked for the FAA until its demanding regime of road travel got old. He moved back to New Meadows to follow in his father’s footsteps, eventually taking over to help out his mom. New Meadows stands in the shadow of Mt. McCall with its legendary ski resort in the Boise National Forest, renowned for its abundant powder snow. Originally it was a farming, ag, timber and mining community. Then some of the large, family-owned cattle ranches got sold in blocks and subdivided into development sites. Tourism came into play, and discovered C&M was there, happy to help. Both brothers are there “elbows on, every day.” But each has his area of expertise. For Chris, it’s computers, inventory, purchasing and receiving. For Mark, sales and customer service. Their staff of 20 each boasts a niche as well, but all are trained to be adept at jumping in wherever needed. “When we moved here, we had 25,000 sq. ft. We’ve since added a 10,000-sq. ft. covered warehouse. Contractors love it, and they like our personal service, guiding them in making strong, fundamental choices. We host vendor-sponsored events for them, too, like our upcoming LP function, for which 50 pros have already registered. “Also,” he adds, “half our staff serves as volunteer EMS firefighters. So if you’re ever in need, it’s likely an employee of ours will show up at your door.” Mark himself serves as assistant fire chief, and Chris sits on the school board. “Our parents instilled community values in us, so we’re glad to help our schools, senior center, churches and library. And we’re involved in the town’s biggest event of the year, Meadows Valley Days. “It’s held on Labor Day weekend, when the town of 500 expands to welcome 1,500 additional visitors. They enjoy everything from the pit barbecue to a crazy contest called Heartland Fiasco.” (Let’s just say that that particular mayhem involves chainsaws and axes.) At Christmas, C&M brings in Santa for photo ops, along with its annual Yule Tool holiday sale. At Easter, out hops the bunny, who oversees the egg hunt and hands out cake. The downside, as Mark is fully aware, is the area’s phone service (or not). And when it comes to social media, he reminds me to set the clock back 20 years. “We just started making inroads, and we plan to improve during 2019,” he promises. Regardless, “business looks good. (We’re only 120 miles from Boise, the capitol.) If the U.S. does well, we do well, too. And up here, we experience all four seasons—three or four feet of snow in winter, when the temperature can drop to -30 or -40 for two weeks at a time. Then in summer, everybody needs AC,” he laughs. Mark has one son and Chris boasts two. “We are the third generation and they are the fourth. The grandkids coming up represent the fifth, so the future looks good,” he reports with well-earned satisfaction. No need to re-set the clock.